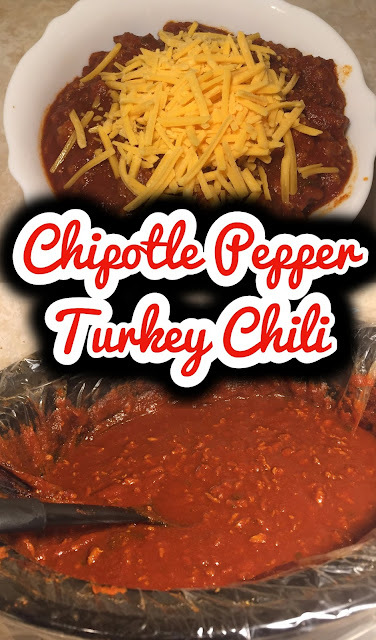 Smoky, spicy turkey chili just in time for the cooler months ahead that will warm you right up from the first bite to the last. In my neck of the woods our first cold front has come through (FINALLY) and it been in the 50's at night and 70's in during the daytime. Where I live that is the beginning of Autumn. Since is cooler outside that is when my family starts to have chili at least once a week or every other week. Its quick, easy, fast and delicious. This is one meal that I remember eating a lot growing up and loved eating. It always made me feel like a warm hug while I eat it. Combine the sauce and spices together the night before and let it sit overnight covered. 1. Combine tomato sauce, tomato paste, dark chili powder, chipotle pepper, granulated garlic, granulated onion, cumin, oregano, paprika, sea salt, celery salt and black pepper. Add water to tomato sauce cans then add to chili sauce. 2. Brown ground turkey in a separate pan then transfer into slow cooker. 3. Turn on low for 5 hours (recommended) or high for 3 hours. Stir occasionally. 4. 30 minutes before serving, turn off the heat and let it sit to thicken and cool. 1. Brown turkey meat in large stock pot. 2. Add tomato sauce, tomato paste, dark chili powder, chipotle pepper, granulated garlic, granulated onion, cumin, oregano, paprika, sea salt, celery salt and black pepper. Add water to tomato sauce cans then add to chili sauce. 3. Bring to a boil then lower the temperature to low and let simmer for 2 to 3 hours. Stir often so it won't burn on the bottom. 4. Take the pot off the heat and let it cool for 30 minutes before serving. I love a good pot of chili! So warm and comforting on a cold night! I appreciate the fact that it's in a slow cooker - I got one a few months ago and have yet to use it! Chipotle Chili sounds so comforting.. It would be awesome to have them on a cold and frosty evening. I never was a huge fan of chili but this looks super yummy. Perfect for cold weather. This looks incredible. Thank you for sharing! I am def going to check it Out! Chili is one of my favorite comfort foods. I actually can eat it year around but do Enjoy it more in cooler weather. This looks fabulous! Chili is one of my favorite comfort foods as well. I actually can eat it year around but definitely Enjoy it more during cooler months. This looks Fabulous! Not only me, but my entire family loves spicy chilly food. This is gonna be make out on this weekend definitely. I really need to make chilli in my slow cooker, this looks delicous! Yummy! I would love a big ole bowl of that chili now! I just made it home and it's kind of cold outside. I'm not looking forward to winter! i absolutely love making turkey chilli in my slow cooker now its getting colder! its so warming and delicious! Yum! This is definitely perfect for the cooler weather we have been having. I love all those spices. This looks so hearty and yummy! perfect for this fall weather! Chili is such a great dish to make in a crock pot, and the nice thing is it can be used in so many ways: topping potatoes, added to pasta, on top of rice, stuffed into peppers or just as is! I'll have to show this to my partner for us to try on a weekend because it looks so good!! Thank you for sharing lovely! Thus looks delicious! I've never made chili with turkey before. Unfortunately it's still in the 90s in Souther California. :( Hopefully it will be cooler soon so I can try this recipe! Mmm, I love chili. And you're right, this season definitely makes me crave chili and soups. Now I'm craving corn bread. Sounds delicious! I'm tempted to try this out. Perfect for the cooler days. Yum - this looks like ideal comfort food for the colder months. Looks super comforting and I am glad you included a slow cooker option, as I love it; it's so easy! I love cold weather, especially when there is something like homemade chili around! The weather is getting really appropriate for some chili right now! This recipe looks great! That sounds perfect to use all the leftover turkey. Love good chilli! YUM! I love using Chipotle in chili. It adds such a great, smokey flavor! I didn't care for chili as a kid, but I do love it as an adult! This chili sounds amazing. I'm not a big fan of chili but this sounds like something my husband would love. Thanks for sharing the recipe. I love chilli! Could this recipe be adapted to be vegetarian? This is so original. I've never heard of chipotle chili before. I might have to make this for our traditional Halloween chili. I have always wanted to try to make chipotle at home! This is such a simple and straight forward recipe I can't not get it right! Ugh I love a good chili recipe, I just made one yesterday! Love the addition of the ground turkey...that's one of my favorites! This looks and sounds delicous! I love making different types of chili. I might make this recipe on Sunday for our Super Bowl party. Thank you!